In what condition is it? 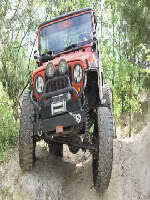 Looking Purty... Now its time to test it..
JaxWranglerUnlimtd wrote: Looking Purty... Now its time to test it.. Yes! Any large oak tree to winch it up would be a good 1st test.